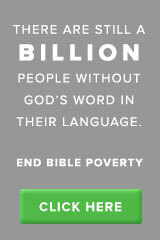 I’ve recently heard how technology is changing the pace of Bible Translation. On a small island country there was a local villager who was working with a Bible Translation Consultant who lived on a different continent. Together they were working on translating the New Testament, progress was not very fast because visits to the small island were infrequent and it was difficult for the local villager to have support he needed to verify and check the work that he was doing. Then there was a donation to bring internet via a satellite to this small village. But the local villager who had been working on the translation never used email or a specialized satellite connection. They gave this man two weeks of training as they configured all the equipment that goes along with the satellite and a new computer and left to go back to their home countries. When the translation consultant arrived home there was already an email waiting in their Inbox from the local villager who had already begun using the technology. I’m excited to hear how this type of technology is accelerating the pace and empowering the mother tongue translators. I also would ask for your prayers for this technology in Cameroon. I have been tasked with the coordination of implementing this type of system in Cameroon and the teams will be coming in a few weeks for the initial evaluations and I ask for your prayers for those that are coming and that I will be able to help them work out the various components to allow this to be a success. I’ve heard it said many times, “God created computers for missions; he just lets everyone else use them.” I guess now we know the same is true for satellites. This entry was posted in Cameroon, Computers, Wycliffe and tagged Bible Translation, Cameroon, VSAT. Bookmark the permalink. You know you are in our prayers. I am so excited with the way God is using you and your family to bring the Word of God, and so hope of salvation, around the world. I never cease to be amazed at God – both His timing, and His work. It’s good to know the specific technological needs associated with missions in Cameroon. Thanks for sharing. I’ll be praying. Love you.